GERD (gastro esophageal reflux disease), also known as acid reflux, is a very common medical condition among inhabitants of developed countries. At least 20% of the entire western countries' residents experience some of the common symptoms of GERD at least once a week. While only a few individuals are actually aware of their medical condition, most GERD patients experience significant decline of their overall well-being and quality of life because of this condition. Since gastro esophageal reflux disease can cause patients a great deal of suffering and lead to serious complications, being able to identify its symptoms in order to quickly diagnose and treat it is of great importance. Both medical doctors and paraprofessionals believe that initial diagnosis of gastro esophageal reflux disease, mostly by using a typical GERD symptoms questionnaire, is essential to ensure the most effective and quick treatment for this condition. According to various estimations, approx 70% of the acid reflux diagnostics that are based on the presence of typical related symptoms are accurate. Classic symptoms of GERD include heartburn and regurgitation. In the case of gastro esophageal reflux disease, contents of the stomach, including acid, reflux (splash up) into the esophagus, causing painful burning sensation that often damages the lining of the esophagus. Other GERD symptoms include, but not limited to: dry cough, chronic wheezing, chest pain (often similar to cardiac-related pain), asthma, nausea and other sinonasal symptoms (pertaining to the nose and sinuses), loss of tooth enamel, bad breath and dysphagia (the feeling of food stuck in the throat). In some instances, acid reflux can also cause damage to the ears (otitis media) and vocal cords (cancer, hoarseness, laryngitis ). Being able to identify those symptoms as an evidence of gastro esophageal reflux disease is crucial for your health and general well being and for the prevention of potential complications. Acid reflux symptoms often serve as an external warning sign of an overall internal imbalance. Moreover, neglected GERD can lead to significant physical discomfort and sometimes may result in severe health complications, such as esophageal cancer and pneumonia. Fortunately, patients can identify most GERD symptoms prior to seeing the physician. If one or more symptoms occur on a regular basis, it is strongly recommended to see a gastrointestinal specialist for comprehensive diagnosis. Disadvantages of curing with Conventional Medicine. 1. Prescription medication and over the counters merely touch the external symptoms of your disease, whereas acid reflux is a complex condition triggered by a wide set of internal and external factors and co-factors. Because conventional treatments tackle only the symptoms of the disease and not the root cause, daily dosage of drugs is required to keep the symptoms under control, thus creating life long dependency on drugs and over the counters. 2. Certain drugs including antacids and especially PPIs can cause a myriad of uncomfortable to dangerous side effects. 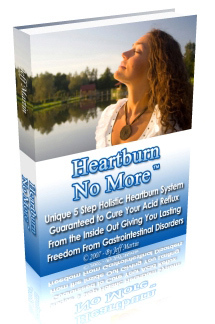 The holistic approach that tackles the internal, lifestyle and environmental factors that trigger acid reflux in the first place and fixes the root problem that contributes to this condition, is a much more effective and long-term solution. No matter what the severity of your GERD is, addressing this condition by adhering to the holistic approach will ensure that the root causes of your acid reflux are tackled permanently and safely, thus significantly improving the quality of your life.